Beijing 2008: Discovering Usain Bolt // Who is Usain, and should we be surprised? Well, halfway into the athletics programme of the Beijing 2008 Olympic Games, and the name on everyone’s lips is Usain Bolt. The man with the most appropriate name in track and field (a close second is Philip Spies, who was a South African javelin thrower…”spies” is the Afrikaans word for javelin) has electrified the Beijing Olympic stadium, setting two world records to claim the 100m-200m sprint double. He became the first man in history to break BOTH 100m and 200m world records at the Olympic Games, and when you consider the caliber of athlete who has gone before him (Jesse Owens, Carl Lewis), that is an incredible feat. But more than this, it’s the manner of his victories that has set him apart: He won the 100m race celebrating over the line, pumping his chest and playing to the crowd, and the 200m race was won by 0.5 seconds. Truly incredible performances. It’s led many to suggest that Bolt is the “Greatest ever”. He may well become that, but it’s a typical case of hyperbole “in the moment”, as people do tend to get slightly carried away with such incredible performances as they happen. We’ll wait until he adds some longevity to his list of achievements – a world championship title, maybe another Games, and then he’ll certainly add his name to a list that includes those of Owens and Lewis. There’s no question, however, that when Olympic historians make the DVD of the Beijing Olympic Games in 2008, they’ll have a choice between two “faces” of the Games – Michael Phelps, and Usain Bolt. So who is this guy? And should we be be surprised that he’s taken the world of sprinting and turned it upside down, breaking records while celebrating, beating times that were thought to be “unbeatable”? There are some tricky issues that need discussion (doping, rearing its ugly head once again, though we don’t have the answer to that one), and I thought a post “Discoveing Usain Bolt” was in order. Usian Bolt has had “world class” stamped all over him from a very young age. He was born in 1986, and actually turns 22 today (the crowd sang “happy birthday” to him after his 200m victory yesterday). The times Bolt produced as a teenager are extra-ordinary – a sub 21 second clocking at the age of 16, and the youngest person to ever claim a medal at the World Junior Championships speaks of some enormous natural talent. What is interesting is the progression in times over the years. This has relevance for the doping debate, because Bolt has, by virtue of his dominance, now been placed directly in a spotlight of suspicion, such is the world we live in today. We know that sudden, “unexplained” performances are an indication of doping, though finding proof is another story. 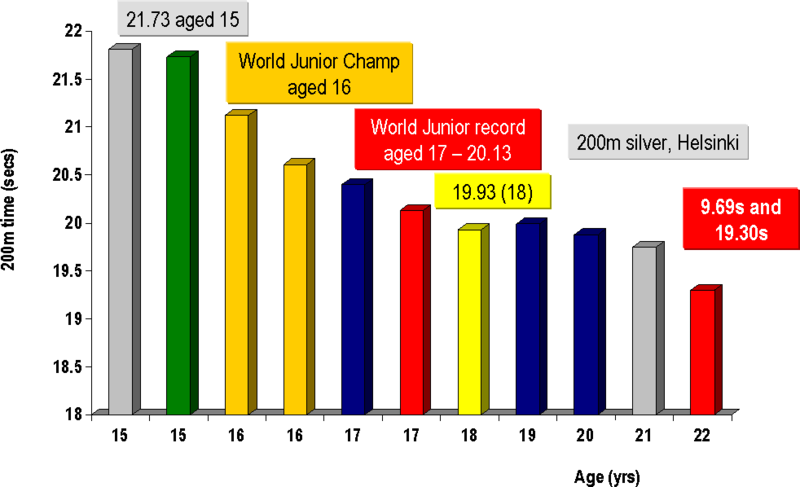 Looking at Bolt’s progressions, I think it is interesting to see how rapidly his times were falling during his teenage years – a 21.81 at age 15 became a 19.93 at the age of 18. That certainly does predict some impressive times later in his career. An 18-year old who runs 19.90 is quite conceivably a 22 year old running sub-19.5 seconds…could he have been on drugs at that age already? Even the hardest sceptic would not think it likely. But then Bolt kind of hit a few snags – injury problems were predominantly responsible between 2005 to 2007, and he had a string of disappointing results at major championships. He failed to advance beyond the heats in Athens, and he came 8th in the Helsinki Final with an injury. It seemed that Bolt had reached something of a cross-roads. 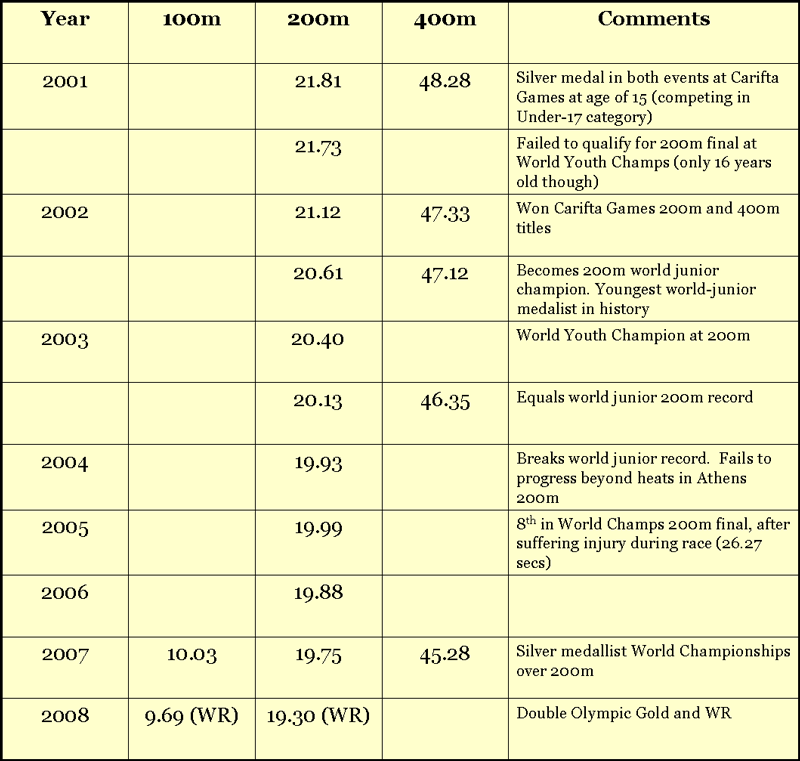 The three years between 2004 and 2007 produced an improvement of 0.18 seconds. The three before that (2001 to 2004) had given him 0.88 seconds. We now know what happened at the cross road, because in 2007, he had something of a “breakthrough” year, winning silver behind Tyson Gay at the Osaka World Champs, and he was really the clear second best in the world over 200m last year. 2008 brought with it a quantam leap, in sprinting terms, anyway, as he suddenly jumped into the next level with his world record of 9.72 seconds over 100m in New York. The rest, as you’ll all know, is history, and he’s now the dual world record holder. So can we tell anything from this progression? Well, he’s clearly incredibly talented, a junior with a remarkable record, which suggested he’d be a star on the track one day. It’s very difficult to use this for anything more than suggestive purposes, because you never know what the ceiling is. Bolt’s incredible junior performances, and his rapid improvement from 15 to 18, might be nothing more than a symptom of early physical development. Then again, they do suggest that Bolt is a naturally-exceptional runner, whose future has always been promising, and that the times he’s produced in Beijing lie on the journey he began as a 15-year old. But the big jump forward in 2008 is, for many, a flag that initiates a rather cynical debate, one which unfortunately holds no obvious answers. It is possible, given his early progression, that he was always going to run this fast. The “blip” in the middle might be solely due to injuries and perhaps a lack of focus in those years. Who knows? While we can appreciate where he’s coming from, it’s not an entirely helpful way of putting the debate across. In fact, it’s destructive to the debate. But unfortunately, the debate would be incomplete without confronting this particular issue, so let’s turn our attention to this issue now. First things first, when the issue of doping comes up, don’t shoot the messenger. Rather save your bullets for Ben Johnson, Tim Montgomery, Marion Jones, Dwain Chambers, and the countless other cheats who have defrauded you (and Bolt, by association) in the past. The sport is unfortunately tainted – there are no major sprint champions in the last 30 years who have escaped suspicion, and many have been caught or confessed. So Bolt is guilty by association, which is of course not fair. However, because it’s become impossible to prove innocence, we rather default into a position of “implied guilt”, and we doubt spectacular performances. Marion Jones proved that NEGATIVE test results are meaningless by passing more than 100 tests in her career, and so the fact that Bolt has passed 11 doping controls this year is almost irrelevant to the debate. Similarly, Bolt (or any other athlete) can appeal to our consciences and human trust all they wish, but Jones, Montgomery, and the many other drug users who have been caught after forcefully denying that they ever used drugs have shown that athletes can be world-class actors too. So while Bolt may deny doping, and do so sincerely, the athletics loving public are at the point where they’ve seen it all before. Once bitten, twice shy, so to speak. Now, Bolt might well go on to join the ranks of cheats, if he’s ever caught. But until then, I’m prepared to go out on a limb and say that I believe Bolt is less likely to be doping than any sprinter before him. That may be naive (perhaps I want to be naive on this one, it beats cynicism), but I honestly get the perception, watching Bolt run, that his advantage lies not in the power and strength of sprinters before him, but in his co-ordination and some level of neuromuscular advantage which I must confess I can’t fully pin down. So while it is a ‘bald assertion’, Bolt alone doesn’t arouse the same level of suspicion, partly because of his appearance, his running style, and because his prodigious talent as a junior doesn’t create the same doubt one would get from the sudden emergence of a sprinter. However, Jamaica’s dominance in the sprint events doesnt’ do Bolt’s case any favours. Jamaica have now won EVERY SINGLE short sprint at the Beijing Games – the 100m and 200m titles for both men and women belong to Jamaicans. In fact, out of a possible 12 medals, Jamaica now own 4 golds, 2 silvers, 1 bronze. They also have the 400m hurdles champ for women, and should win the relays too. For such a tiny island to dominate to that extent is generating a great deal of suspicion, thanks to the events they happen to be winning. One argument is that the people are just “born sprinters”, naturally endowed with some gene that allows them to run faster than anyone else. But then, the same gene pool has been there for decades, and Jamaica has never been this dominant. Good, yes, but not to this extent. So I for one am dying to know what is happening in Jamaica. I’m not suggesting they’re cheating, but whatever they are doing, I’d love to know, and to implement it elsewhere. At the risk of losing my scientific objectivity, I do believe it to be possible that they might be so dominant without doping. But while I think that, there’s this nagging voice at the back of my mind reminding me of just how many major champions over 100m or 200m have been dopers, so why should this be any different? Success as sprinting is an automatic “flag”, thanks to the exploits of Marion Jones, Ben Johnson and the like. So while it’s not a specific slight on anyone (regardless of where the medals were headed after Beijing, the same debate would be in play), it’s a flag that will cast even more scrutiny on Bolt’s performances…Let’s hope this flag denotes coaching excellence and great genes, not systematic doping. But returning to Bolt, we have to wait out to see what his future holds. As I said, I am less sceptical of Bolt than of any other sprinting champion, and don’t believe that he is doping. I may be proved incorrect (and “idiot”, even, according to some), but I think there comes a point where you have to view performances with a bit less of a cynical view, until provided with reason to do otherwise. So what then, is the key to Bolt’s brilliance? As mentioned, neuromuscular factors are surely involved, I believe. I’ve not seen such an elastic runner before, and I suspect that Bolt’s advantages stem from a superior stretch-shortening cycle function, which allows energy to be stored and used more effectively. We know from research that power output is proportional to the amount of energy that can be stored and released from the muscle-tendon junction during the muscle contraction. Add to this certain anthropometric measurements, and perhaps there are justifiable, credible reasons why one athlete can run a 19.30s time naturally. Who knows? The only thing we do know is that if Bolt is one day tainted or caught, it might well be one of the biggest blows the sport has ever taken. Let’s hope that day does not arrive.